With comfortable seating, warm lighting, and cozy accessories, the living room can be the perfect gathering place for talking and relaxing. 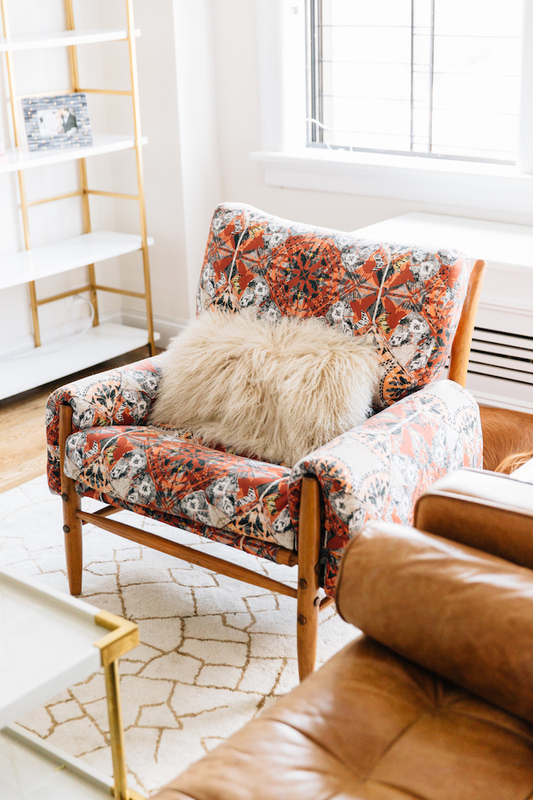 Whether your room needs a complete overhaul or just a few quick updates, in this week’s guest prep I’m sharing tips for creating cozy living spaces. One of the most important investments in a living space is seating. 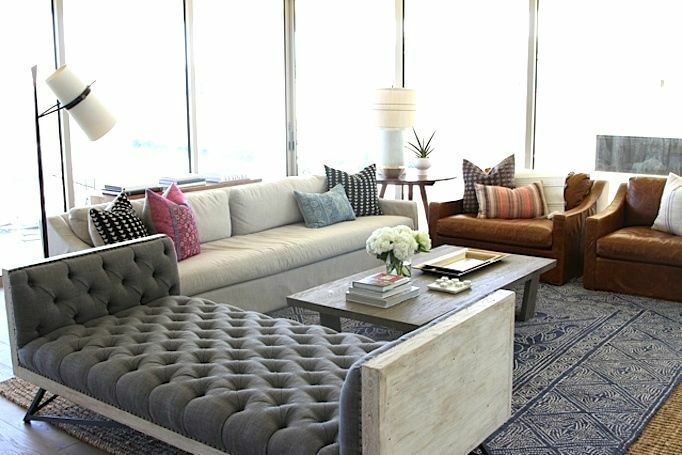 I look for clean lined sofas with plush cushions and soft durable fabrics. A fun option when updating your space is to replace your couch’s matching love seat with a daybed. Take a look at my daybed roundup for inspiration and some favorites. With friends and family visiting, it is nice if your room has plenty of seating. Try fitting a statement chair in the corner or across from your sofa. Pick one in an interesting shape or rich pattern to update your look, or get creative with a non-traditional seat. In the living room of my Talega South project, I paired plush linen slipcovered chairs across from leather sling stools. The stools create a cozy arrangement without using much space. Redesigning your coffee table is a quick way to get a fresh look. Start new with a reclaimed wood table like I did in my Estillo project, or simply add a plant and a few new accessories to the table you have. Brass accents are on trend and a rich look for fall. Here, I added a marble and brass tray that works for serving and a brass vase. A favorite trend is to layer rugs. Layering a patterned rug over a large jute adds texture to a space. It is also an affordable way to cover the floor. I wrote more about layering rugs and shared some favorite rug combinations here. Another cool rug option is a shaggy Moroccan. Moroccan inspired rugs are a perfect fall update for their cozy texture and warm vibe. Check out my guide to Moroccan inspired rugs here. Consider a new floor lamp to add light and interest. Pick something unique and modern to mix in with your coastal or transitional home. The mix of styles will feel fresh and add a little bohemian flair. 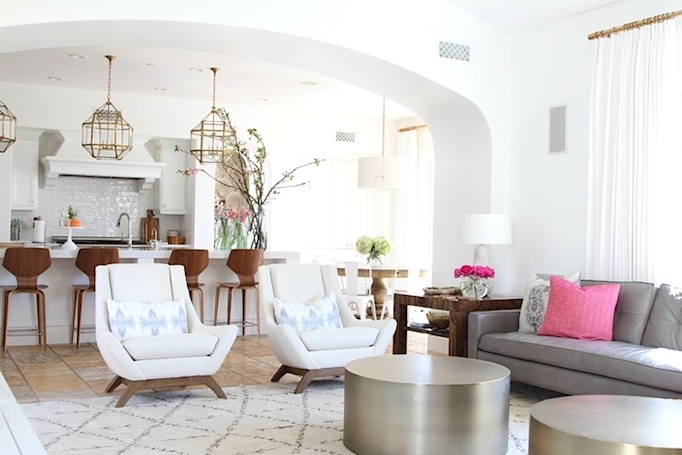 This Arteriors floor lamp is a favorite of mine and I used it in both these living rooms. For a less expensive similar option see here. 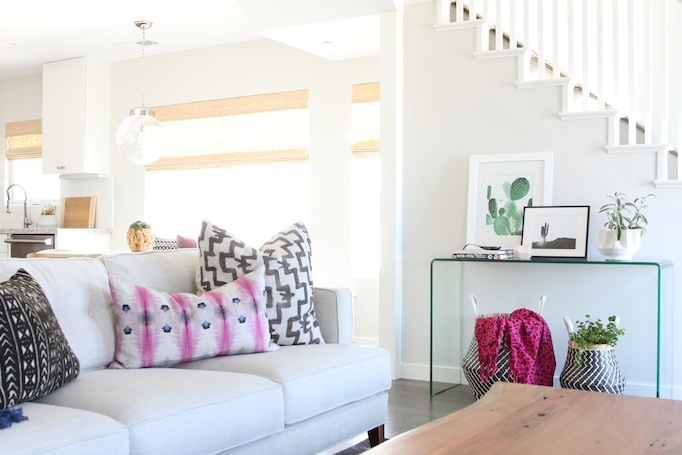 The fastest and most inexpensive update is to layer a soft throw on your couch or in a basket. Chose a throw in a rich hue for a pop of color, or a textured wool for warmth. I have a cool knit throw with pom-poms that I use in my bedroom, but it would be beautiful thrown on the edge of the couch. Living spaces are meant for gathering and lounging. Even small changes can get your room ready before holiday visitors arrive. If you missed it, make sure you browse last week’s Guest Prep: How to Style a Bedroom and check back soon for more guest prep ideas. Have a happy Monday! This time of year has me reflecting on one of my first projects – the San Clemente Beach House. It really has the timeless look and neutral canvas of coastal homes. 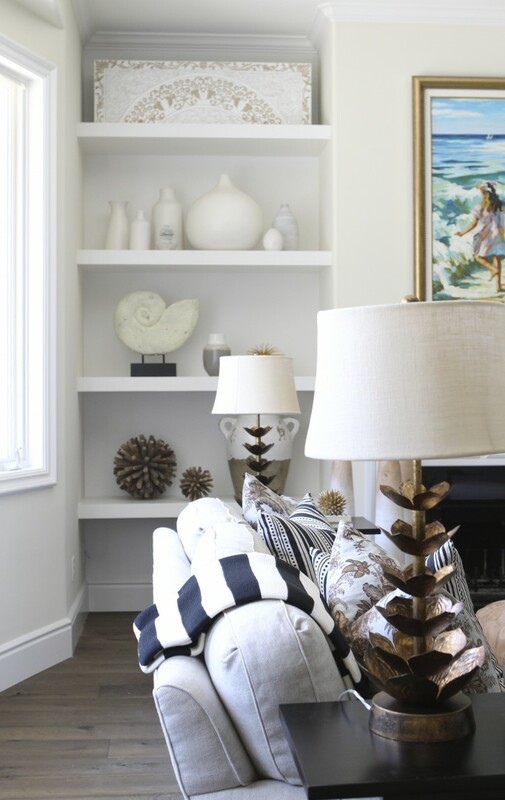 Today, I thought it would be fun to look closely at the main living area of this project and the specific elements that make it a classic coastal living room. The main floor of this beach house is an open floor plan divided into several different spaces. 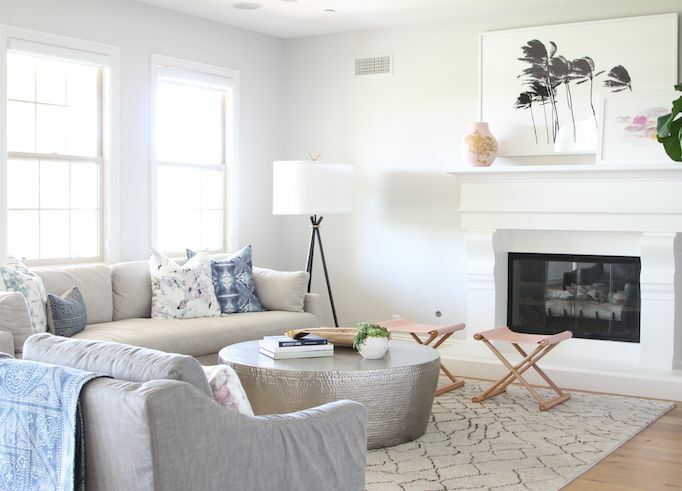 With this in mind, the vision for this beach house living room was to create a comfortable gathering place for friends and family while maintaining the elegance of the home. I choose a monochromatic color palette, creating warmth and interest with textures and pattern. The result was a casual yet elegant beach house living room. The foundation for the space was a neutral rug in a subtle pattern to define the space. Then I choose a sand colored, slipcovered, linen sofa with clean lines for a more updated look. A large rustic, wood and metal coffee table serves as a display for aqua glass accessories and interesting coffee table books. For more seating and to add warmth and interest, I added bamboo wood lounge chairs with custom upholstered, striped cushions. All of the pillows in the space were blues and grays, but I played with patterns and textured linen fabrics. A ceramic white stool works as a side table and brings a global element to the room. For the final touches, I added a natural stained bench add added a pop of color with a soft chevron throw. The combination of comfortable linens, natural woods an a tone on tone neutral palette created a long lasting beachy look, perfect for entertaining family and friends. To get the look for your own homes see below. Have a wonderful day! Recently, I had the pleasure of working on a home for a young, Southern California family with a love of clean lines and a white palette. They wanted a home with a modern coastal look that was polished, yet livable. It was a lot of fun realizing their vision, creating fresh, comfortable spaces for them to live in and entertain. I’m excited to share the family room of the Estillo project with you today. When shopping for white furniture, we looked at Restoration Hardware. My client knew they wanted white seating but wanted to be able to clean it easily and have it wear well. 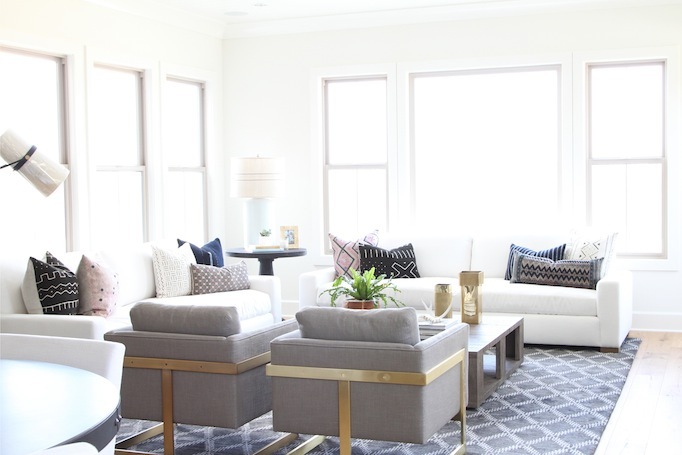 Restoration has a huge selection of modern and transitional furniture pieces to choose from, but more importantly their perennial fabrics were a perfect option for the white furniture in the room. Since all the walls were painted white (Benjamin Moore Swiss Coffee), we picked a charcoal rug for high traffic and to ground the space. 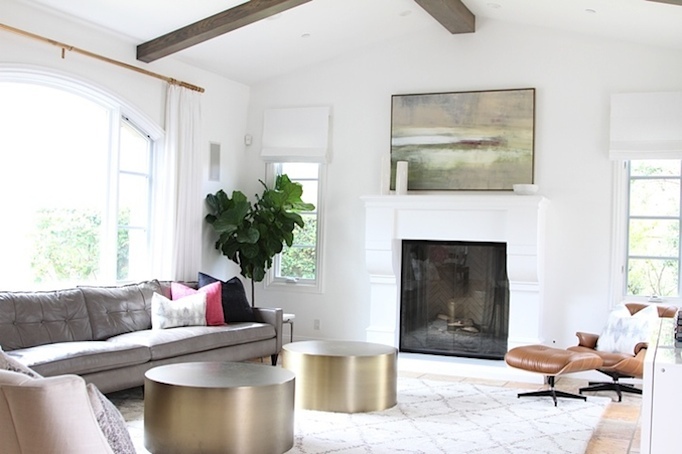 It’s nice when white is the main color in a space to create contrast and take some of the cleaning pressure off with a rug that doesn’t show wear. With such a clean, minimal foundation, we decided to add vintage textiles to the sofas. I love adding the boldness of black against white for a more polished look. The unique patterns and colors of the hand-woven pillows pulled the space together,creating a more comfortable, casual vibe. The accessories in the room were key. 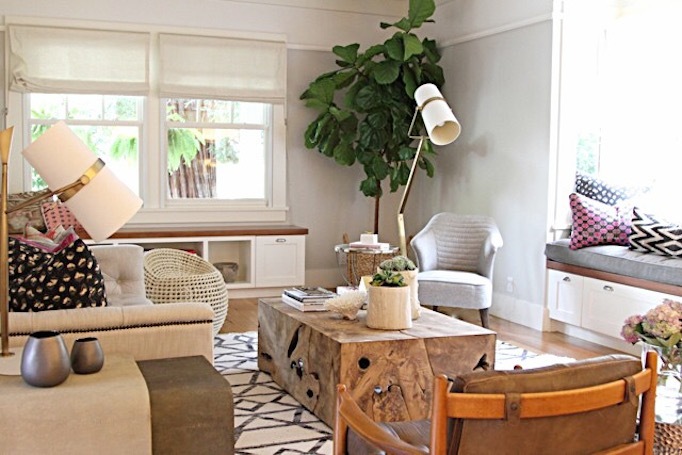 The large wood coffee table created a perfect space to add some style with unique objects and coffee table books. Some of my favorites were the brass vases and a marble tray that could work later for serving. Then, I added an organic element of live greenery. Plants always add so much to a space. From the sideboard to the european oak flooring, the light wood neutrals in the space blend with the light pallette of the room and add to the modern, coastal style. Thank you for checking out the Estillo project family room. To see more of this project stay tuned. I will be sharing the kitchen soon. To get a similar look for your own home see below. Have a wonderful day! The warm cinnamon scent and rich colors of this healthy, Moroccan-spiced dish are the essence of fall. It’s the perfect way to add a surprise to a typical meal. I love the idea of mixing in some global influence through tastes and textures. This dish, paired with the exotic textiles, shiny metallics and unique graphic prints of Moroccan-inspired design will add interest and a more curated feel to your home. You can incorporate Moroccan style with just a few new pieces that will have a big impact on the vibe in a space. 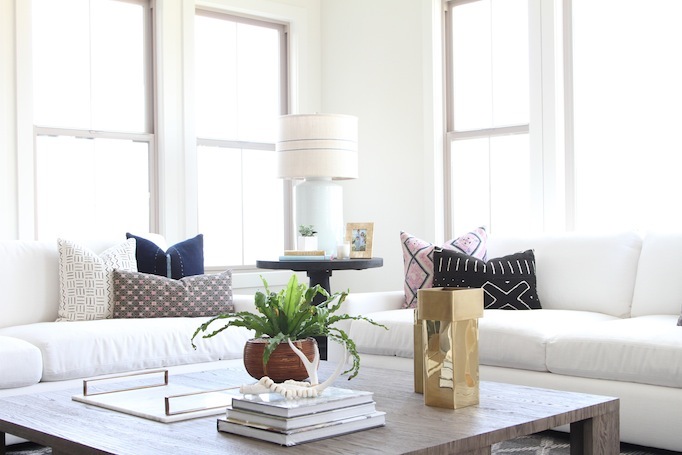 One of my favorite ways to introduced global style into a home is a Moroccan style rug. These rugs are soft, comfortable and do well in high traffic areas. They look beautiful layered with metals and eclectic textiles. I love the shine from moroccan shaped mirrors and unique lighting. The moroccan inspired star pendant in this bathroom, via m.elle design, adds the perfect amount of charm. Too add some character, consider layering these gilt moroccan style mirrors above nightstands for a beautiful accent in a bedroom. Today, I’ve gathered some fun Moroccan inspired finds for you to browse. Several have rich colors and are warm updates that are great for fall. I hope you have enjoyed these inspirations for tastes and textures. Have a wonderful Monday! Moroccan Glass Pendants – On Sale now + Extra 20% off! In a bowl, toss the parsnips and carrots with 2 Tbs. of the olive oil, the cumin, turmeric and cinnamon. Spread the vegetables in a single layer on the prepared baking sheet and season well with salt and pepper. Roast, stirring a couple of times, until the vegetables are very tender and caramelized, 35 to 40 minutes. Meanwhile, in a saucepan over high heat, bring the broth to a boil. Add the quinoa, cover and reduce the heat to medium-low. Cook until all the broth is absorbed, about 12 minutes. Transfer the quinoa to a large bowl and add the roasted vegetables, apricots, almonds and parsley. Stir in the remaining 4 Tbs. (2 fl. oz./60 ml) olive oil, season with salt and pepper and serve. Serves 4 to 6. Receive 20 percent of any 1 items at William Sonoma with code UPICK – Limited Time! If you missed the full reveal of this space you can view it here for complete details and resources. Plus, don’t forget to check out this week’s favorite finds below. Have a wonderful day!